So you’ve made the all-important decision about which type and size of television to buy, you take it home and now it’s time to install it. The question is, do you want it to look like it did in the store? If so, how do you intend to install and tune your TV? Will you attempt the installation yourself? Run wires through the wall for each TV input in your home. It certainly costs more but when you buy that high-end gaming console or a Blu-Ray player, you’ll thank your farsightedness then. Another way of future proofing your installation is by throwing an additional HDMI cable or two into your wall to future proof against any future purchases of gaming consoles, apple TV etc .. When wall mounting your new TV, be careful not to place it too high. You may be tempted to install it at picture height but the ideal elevation should be such that the TV’s centre is around 45 inches from the floor. This height corresponds to our eye level at sitting position. Then there are people who have found that a slightly higher mounting leads to a more cinema-like experience and more immersive console gaming. New data cable and power outlets need to stay behind the TV, either at the top or bottom of the TV bracket. Data or video cables are low voltage and you can accommodate them in open-back boxes if there are additional cables you need to run after the first installation. If your wall has an uneven surface, use plywood or MDF that’s slightly larger than the bracket. Cut and mount the MDF properly to the stone or brick surface first and after you ensure things are in place, attempt installing the bracket onto that. Sometimes in the excitement of buying a new television, we find that most people use the wrong cables or don’t properly install the television bracket. Hiring a professional to install your telly means your television will be working at optimal performance. Call us at Jim’s Antennas and we will professionally install your new flat panel onto your wall. We even hide all those messy cables. Our technicians will mount your screen neatly and professionally, giving you peace of mind that it is secure and safe, which is particularly important if you have young children at home. Jim’s Antennas has access to a wide variety of brackets, for all types of TVs to fit your installation requirements. 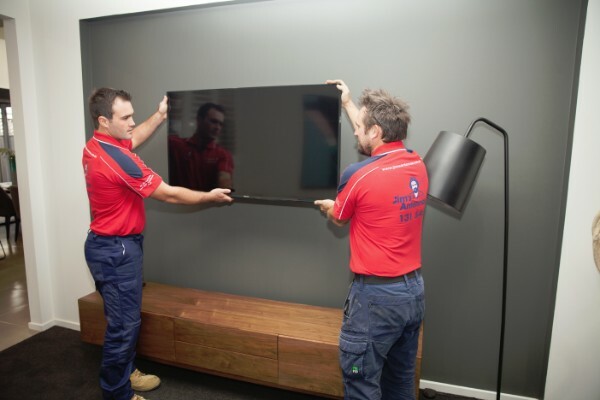 If you prefer your flat screen installed to a stand or cabinet, Jim’s Antennas technicians also assist in securing your television unit for safety and performance. Even if you handle your television installation but still don’t have clear reception, call us and we’ll figure out your TV reception problems. It doesn’t matter if you’re having digital TV reception problems or cabling issues, our experienced, qualified and professional team will have you enjoying your new television and favourite shows without any fuss. Ask for your free quote today! Just call us on 131 546, sit back and relax. You will be enjoying clear reception on your TV sooner than you imagined.